UNCASVILLE, CONN. – May 24, 2017 – The auction block will be rumbling off the power of one of America’s favorite sports cars at Barrett-Jackson’s 2nd Annual Northeast Auction, June 21-24 at Mohegan Sun in Connecticut. The World’s Greatest Collector Car Auction® will feature some of the finest custom and restored Corvettes during its premier automotive lifestyle event, including a ’66 Corvette Resto Mod Convertible (Lot #652), a ’57 283/270 Convertible (preview) and a ’68 327/400 custom build (Lot #768). 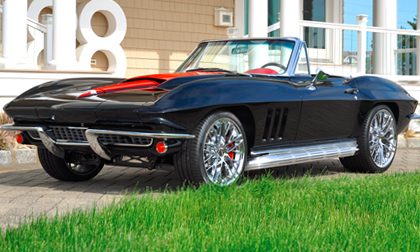 Some of the notable Corvettes crossing the block at Mohegan Sun include a ’66 Convertible (Lot #652) featuring a ground-up custom build with a modern suspension and chassis based on the design of Art Morrison. This Corvette is the result of thousands of man-hours and includes the most up-to-date C6 Corvette suspension, LS3 V8 engine, manual transmission and new interior. A ’57 283/270 Convertible (preview) is finished in the rare Cascade Green and features the original factory racing setup. Over the last 10 years it has undergone a rolling restoration that meets NCRS standards, and includes a new reproduction steering wheel, working original Wonder Bar AM/FM radio, as well as working original gauges and clock. Another like-new restored Corvette is a ’62 327/360 Convertible (Lot #642) representing the last year of the first-generation models. It’s powered by a rare fuel-injected V8 engine mated to a 4-speed manual transmission. This Corvette is one of the finest examples of the first-generation Corvette models. One of only 3,832 big-block Corvettes produced, a ’67 427/390 (Lot #727), is powered by an engine rebuilt by the famed Hendricks Motorsports. Finished in rare Marina Blue, this 4-speed manual transmission sports car features power disc brakes, factory air conditioning and side-mount exhaust. Another Corvette destined to be a fan favorite is a ’64 small-block 327 with 350 horsepower (preview) that’s finished in the ultra-rare factory color code of 900 Tuxedo Black over a red interior. It’s powered by a matching-numbers V8 engine rebuilt during a frame-off restoration that was well-documented with photos, receipts and reports. A truly unique build, a ’68 327/400 custom (Lot #768) underwent a quality nut-and-bolt restoration. It is equipped with a ’55 Chevrolet dashboard, side pipes, Foose rims and upside-down Camaro nose, and the powerful small-block V8 engine connects to a 4-speed manual transmission. The total number of Corvettes produced in 1970 was 17,316, making this model year the smallest since 1962. One of two ’70 Corvettes currently set to cross the auction block at Mohegan Sun includes a Daytona Yellow Sting Ray 454/390 (Lot #631). Under the hood of this American sports car is a rare big-block V8 engine with 4-speed manual transmission. Special options include Rally wheels with raised white-letter tires with sombrero caps, along with removable T-top and rear window glass. One of only 1,287 produced for 1970, Lot #630 is a rare LT-1 Convertible that has only 26,420 original miles. Under the hood of this Marlboro Maroon Corvette is the original V8 engine and 4-speed manual transmission. It comes with many of the original documents, including the consumer information booklet, AM/FM radio warranty paper, Protect-O-Plate, owner responsibility pamphlet, and owner’s manual and bag. The 2017 Northeast Auction Docket is now available. Click here to consign a vehicle for the 2nd Annual Barrett-Jackson Northeast Auction or for information on becoming a bidder, follow the link to Barrett-Jackson.com/Bid.